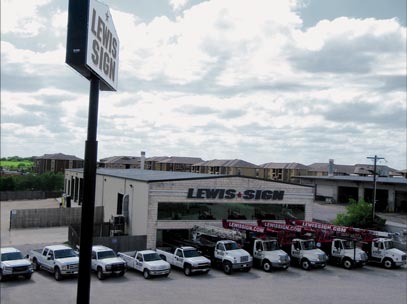 Whether you are a national company that has locations throughout the country or a local business owner that has one location, you can take comfort in the abilities of our installation team at Lewis Sign. Lewis Sign makes the sign installation process painless. Our permitting staff will handle the permit procurement process, so that our customer does not have to interact with the City’s Permitting Office. At Lewis Sign, we have hundreds of years of combined installation experience; our ability to make you look good is what sets us apart from our competition. Size does not matter; we can install small banners to high-rise corporate signage and everything in between. We take pride in our fleet; we own and utilize the latest and safest lift equipment available to our industry. You will be proud to see your beautiful new sign installed by our team of qualified and licensed installers, you will rest easy in the fact that the job has been completed with Honesty, Integrity and Quality.